One of the drawbacks with a line of toys whose heads can come off to become little robots of their own is that eventually some people are going to lose those heads. Back in the 1980s, Hasbro didn't give much thought to that -- it was impossible to get a replacement head if you lost one. Takara were a bit more thoughtful, offering separate head figures that you could buy to pair up with the bigger robots. This time around Hasbro's taken it one step farther: replacement heads with their own mini-vehicles, giving them a fair bit of play value above and beyond "head replacement". All of those figures are based on preexisting characters, some well-known and others quite obscure. 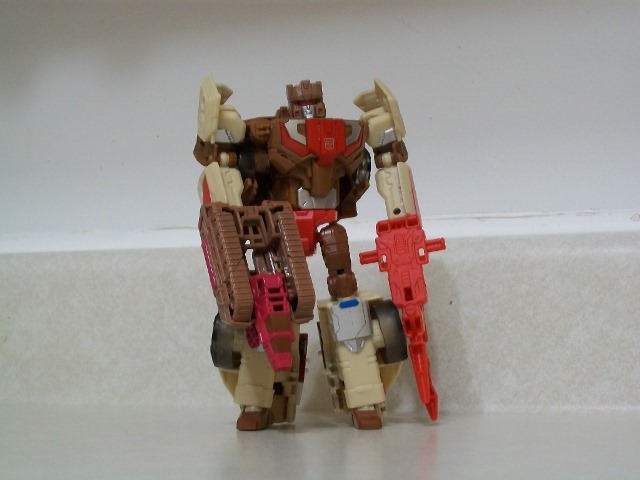 Skytread here is more towards the obscure side of that spectrum, being based on the 1987 Duocon Flywheels. 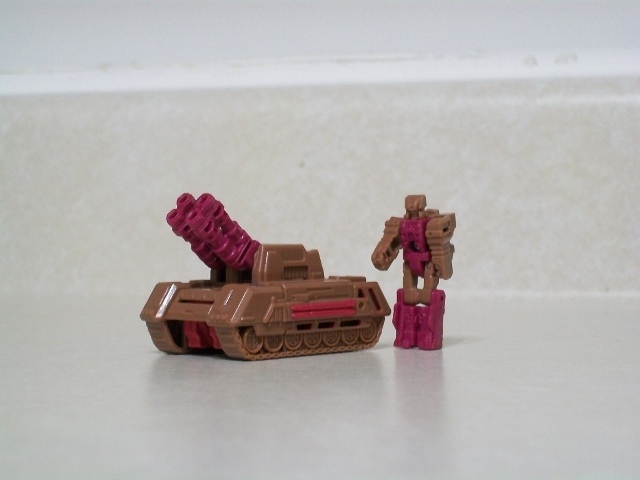 He comes with a mini-vehicle based on his original toy's alt-modes, converting form tank to jet to weapon. And for such a small, inexpensive set, there's quite a bit to review! Titan Master: Skytread himself is a simple little figure, standing about an inch and a half tall in robot mode. He's got a ball-jointed neck and shoulders along with hinged hips and knees, with the lower legs molded into a single piece. That's about as much articulation as you should expect out of a figure this size, and provides all the range of motion he needs to interact with his mini-vehicle. His chest and lower legs are a dark reddish-pink while his head, arms and thighs are brown. His face is unpainted, as are most of the later-wave Titan Masters, a move that has inspired some scorn from the fandom. But after seeing just how sloppy the tiny paint apps are on the figures that are painted in my collection, and how quickly they've started to chip, I think Hasbro made the right call. Skytread transforms into a good likeness of Flywheels' head, and in this mode has all the paint you could ask for. In particular, I think his dark reddish-pink optic band is quite fetching. He can serve as a head on any larger Titans Return figure, but Chromedome is definitely the best fit for him in terms of both colour and body shape. All in all I think he's one of the nicest-looking heads in the line. Jet Mode: The mini-vehicle's jet mode is a bit perfunctory, and definitely the weaker of the two. 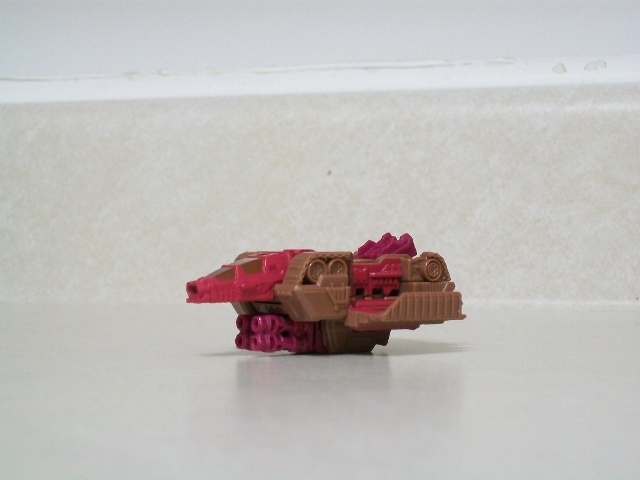 It has the same colours as the Titan Master figure, split about 50/50. 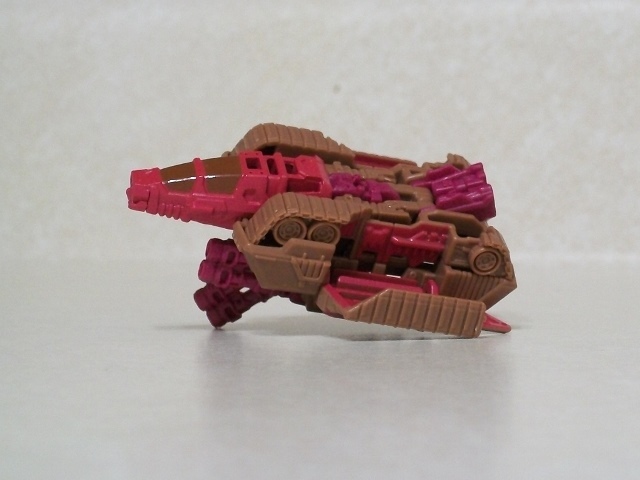 The "wings" are clearly just the sides of the tank folded down, it has a giant turret hanging from its belly and the fuselage is one giant hole unless you plug Skytread (or another Titan Master, though there aren't many others whose colours wouldn't clash) in to fill the hole. I'm sure a kid would have fun swooshing it through the air all the same, and it gives the figure some added play value, but you're not going to want to display it like this. Tank Mode: This mode, on the other hand, is rock solid. It's mostly brown, save for the cannon barrels and some missile details painted on the sides. The left and right sets of barrels can articulate up and down independently, and Skytread can plug into the back of the turret to act as a pilot. The body is a lot more solid than the jet mode, as well. 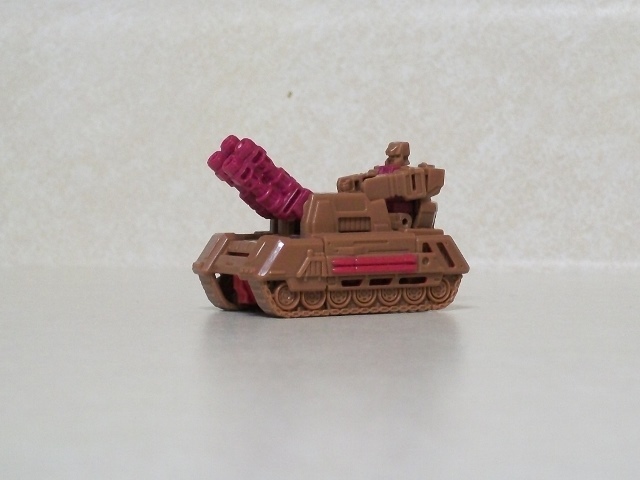 The only real flaw is that the tank could really use a few tiny wheels underneath in order to let it roll when you're playing with it. Gun Mode: In general, the less said about the Titan Masters' gun modes, the better. Skytread is no exception -- in gun mode, whichever larger figure is wielding him is basically pointing an upside-down tank with a jet cockpit sticking out at people. Not especially intimidating, but not something that required much extra engineering either and I'm sure it's fun for the younger crowd.